Macro shot of bed bug. There’s a plague spreading over Indiana. It swarms the state with small, red bodies and six little legs, but their size does not make them an unworthy opponent of the state. These little pests are bed bugs, and once they’ve moved in, they won’t be easily persuaded to leave. According to the CDC, only two types of bed bugs, known as the Cimex lectularius and Cimex hemipterus, use human hosts. Both C. lectularius and C. hemipterus require blood meals in their nymphal stage. In their adult stage, females lay five eggs daily until their death, and these eggs hatch between four and twelve days later. In order to molt into each of their five stages within their life cycle, bed bugs require a fresh blood meal. As an adult, bed bugs can bite several times within a week and live anywhere between six and twelve months, during which time they may go for long periods without feeding. Beginning in late 2018 and carrying into the 2019 year, counties across Indiana have seen one possible bed bug infestation after another. In Muncie, Indiana, the Muncie City Hall was briefly closed starting December 10th after a visitor brought the pests into an auditorium within the building. The building was reopened the next day after an immediate treatment with pest control. 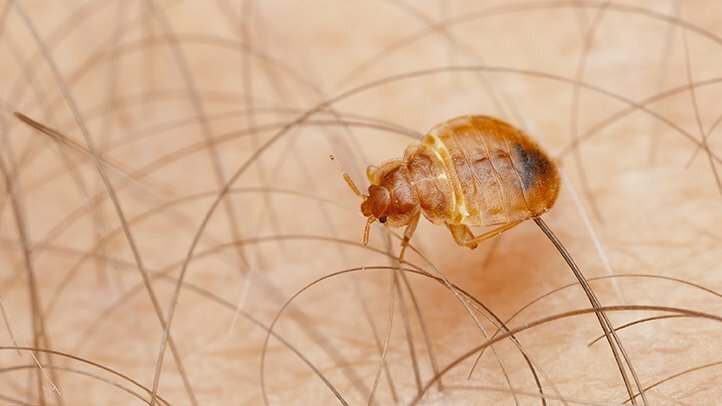 In Gary, Indiana, another public building has recently been treated for bed bugs. On October 2nd, citizens of Gary found the bloodsucking bugs in council chambers during a city council meeting. Once the bugs were found, people in the first two rows of pews were forced to relocate and members of the fire and police forces worked to remove the pews from the building. Similar to the Muncie City Hall incident, this infestation was believed to have been brought on by a visitor to the building who was “covered in them,” according to Gary mayor Karen Freeman-Wilson, who told a Times reporter shortly after the incident. In Vigo County, two offices were closed on November 27th after bed bug reports. After being notified about the discovery of one of the pests, exterminators were immediately contacted. To treat the infestation, dogs were brought in to sniff out the bugs. Using the dogs, two objects — a printer and a mailbox — were found to have infestations and were removed from the building. After removing the items, the buildings opened back up to the public. They are periodically chemically treated to prevent another outbreak. In Marion country, the AMC Classic Theater was confirmed by the health department to have bed bugs in early November. One woman, Adriana Wisner, reported the problem after receiving several bites in the theater. According to Wisner’s boyfriend, who spoke to WTHR 13, the manager of the theater admitted to receiving multiple calls daily regarding the pests, but insisted that there was no proof of infestation. With Indiana under attack, new hope for identifying bed bugs has come from Cleveland, Ohio, where entomologist Susan Jones has created an app for identification and prevention of bed bug infestations. Known as “The Bed Bug Field Guide,” this app contains several images and descriptions for easy identification of the pests. Of course, tips for protection from an infestation are already readily available online. Some steps to take while at school or work are to reduce clutter, and keep your belongings away from those of others. Should a bed bug be found, inform somebody of the bug, as well as alert others in the building to the bug’s sighting. For home safety, remember to check all secondhand furniture, reduce the clutter around the home, vacuum regularly, and treat any items suspected of an infestation. Much more information on bed bugs is available here, if an infestation might be suspected. Indiana is under siege, and it’s time for the Hoosier state to fight back. With Jones’ app and online resources to help identify bed bugs, it has never been easier to stop an infestation before it begins.